crafty goodies: Try It Tuesday~another Canvas Corp project! Try It Tuesday~another Canvas Corp project! This is a fun project to do. I made this celebration mum for one of my grands for their birthday. I used a pink Canvas Corp material flower and built around that. Then center is the Tim Holtz rosette die and then added buttons. The paper is by The Paper Studio. I used one sheet of 12 x 12 pattern paper and cut it into strips and then layered it down the center. I added stickers, brads and ribbon to finish it off. Ohhhhhhh this is just gorgeous!! I love love love love it!! Pinning this!!!! Beautiful and so festive, Connie! so totally fabulous.. always love your creative projects..
Gorgeous mum! We love our mums here in Texas! Wow! 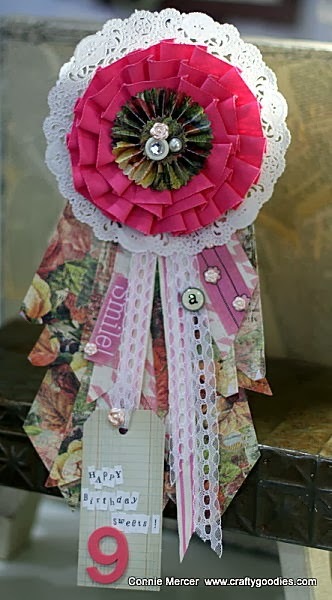 What a great idea and all the little embellishments make this pop. Great. Absolutely perfect to do for my nieces!!!! Pinning for future reference!!! Retiform card~ever heard of it? Memories Frame ~ Clear Scraps! Try It Tuesday~Silhouette machine, finally!!! Working on my paper stash with JBS!!!! Eclectic stamps~Keyhole and Big Key by DRD! Penci and her tag class at Craft Crossing! A guy card with Clear Scraps!!! Everything is Possible with Darkroom Door! Pinwheel Memory Stick and a card ~ Avocado Arts! All About Love~ Avocado Arts!!! Craft Crossing Class~ Jenni Style!!! The Curtsey Boutique ~burlap bag jute holder! Try It Tuesday~wine bottle corks!